Today is the 21st day of Migraine and Headache Awareness Month and Day 21 of our MHAM Blogging Challenge. "Brave:" Watch the video below of Sara Barielles' "Brave" and listen to the lyrics. Then tell us how standing up for ourselves gives us hope. The video is available on YouTube if you want to embed it in your post. Each day of Migraine and Headache Awareness Month, we'll post a new prompt like today's above. The challenge is for bloggers to blog about the topic on their blogs. THEN come back to the day's blog here and post a link to theirs in the comments for the day's post. The next day, we'll Tweet the links people have posted. If you're on Twitter, please post both the URL for you blog post AND your Twitter ID. Please use the Twitter hashtag #MHAMBC for the blogging challenge and #MHAM for Awareness Month. "The Migraine and Headache Awareness Month Blog Challenge is organized by the American Headache and Migraine Association." You can find a list of the month's blogging challenge prompts on our Awareness Month page. 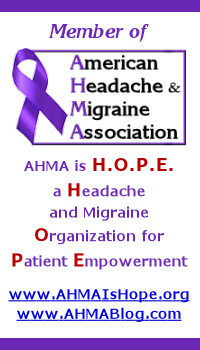 A Headache and Migraine Organization for Patient Empowerment. Today is the 20th day of Migraine and Headache Awareness Month and Day 20 of our MHAM Blogging Challenge. Headache or Migraine Role Model: Who do you know who has any form of headache or migraine whom you look to as a role model for inspiring hope and never giving up? How do they inspire you? When you go back to the prompt, please take some time to tweet what others have blogged. You'll also be able to retweet them from @AHMAOrg or @TRobert. Today is the 19th day of Migraine and Headache Awareness Month and Day 19 of our MHAM Blogging Challenge. "Stronger - What Doesn't Kill You" Interpret the Song: Watch the video below by Kelly Clarkson and listen to the lyrics. Then tell us how it applies to living with Headaches or Migraines. The video can be found on YouTube if you want to embed it in your post. Today is the 18th day of Migraine and Headache Awareness Month and Day 18 of our MHAM Blogging Challenge. Hope from Our Doctors: Share what your doctor has said to you that give you hope. Today is the 17th day of Migraine and Headache Awareness Month and Day 17 of our MHAM Blogging Challenge. "Hope rises like a phoenix:" Put yourself in the place of the phoenix, and describe your rise from the ashes. You're welcome to use the image in your post as long as you don't make any changes to it. Our annual conference for people who have Cluster Headaches, Migraine, and all other Headache disorders, as well as their family and friends is just days away. Panel Discussion / Q&A for topics not discussed in other sessions. A buffet lunch is included, and care has been taken to provide a range of foods so participants can avoid food triggers. Because fragrances of any kind can be strong Migraine triggers, this is a fragrance-free conference. Please do not wear perfume, cologne, after shave, or any scented product. Today is the 16th day of Migraine and Headache Awareness Month and Day 16 of our MHAM Blogging Challenge. What Color Is Hope? Colors can be very powerful. They can give an impression in a single glance and affect how we feel. What color do you envision when you think of hope? As best you can, tell us why and how that color makes you feel. Today is the 15th day of Migraine and Headache Awareness Month and Day 15 of our MHAM Blogging Challenge. "When You Believe:" Watch and listen to the video of Mariah Carey and Whitney Houston performing "When You Believe," then tell us how it can inspire hope. You can find the video on YouTube if you want to embed it in your post. Today is the 14th day of Migraine and Headache Awareness Month and Day 14 of our MHAM Blogging Challenge. "Hope lies in dreams," Interpret the Quote: Tell us what the quote on the image below means to you. All members of the American Headache and Migraine Association (AHMA) are invited to the launch of our Headache and Migraine support groups on Monday, June 15, at 3:00 p.m., eastern time. To eliminate geographic limitations and allow members to participate even when not feeling well, our support group meetings will be held via conference calls. This is also the form of support group meeting chosen by AHMA members in a member poll. AHMA Special Interest Squads for different Headache Disorders. The schedule for our monthly support group meetings. Topics for the monthly support group meetings. Any questions members may have. For the call-in information for the call, check the AHMA Facebook group or email sisahma@gmail.com. Interested, but not an AHMA member? Consider joining AHMA now. Annual dues are minimal and are waived for active duty service personnel and their immediate families as well as disabled veterans and their immediate families.